Arnold Whittall, The Wagner Style. Close Readings and Critical Perspectives, edited by Christopher Wintle, xii + 250 pp. with illustrations and music examples. ISBN: 978-0-9931983-0-4 (hardback) and 978-0-9931983-1-1 (softback). The series is a new initiative that focuses on critical and analytic issues surrounding opera of any period but excludes histories of opera as well as biographies of composers, singers, conductors, producers and so forth. It may also include modern polemical writing. 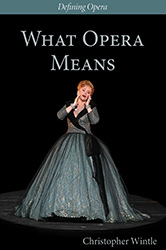 It is edited by Christopher Wintle, an Emeritus of King’s College London, who has written extensively on opera since Mozart, who for many years reviewed opera for the Times Literary Supplement and who has contributed regularly to the programmes of The Royal Opera; and it is typeset by Julian Littlewood, author of the monograph, The Variations of Johannes Brahms. The book celebrates the 80th birthday of Arnold Whittall, Emeritus Professor of Music at King’s College London, with a collection of his key writings on Richard Wagner. The composer’s ambitious, innovative ways with words and music have never ceased to fascinate, never more so than now, two hundred years after his birth in 1813. The first ten chapters deal with the three Romantic operas, the four parts of The Ring and the three remaining music dramas. Their aim is to illuminate those aspects of Wagner’s style that are both personal and important for his successors. Whittall sets close readings of key passages in the context of a critical debate that has itself raged for over a century, and his comprehensive range of reference makes this volume essential reading for all those who want to enter the debate. The final chapter deals with Jonathan Harvey’s Wagner Dream (2007), a modern operatic treatment of Wagner the man and his unrealised Buddhist project, Die Sieger. Whittall’s style is focussed and discriminating, yet also relaxed and accessible. The book, which presupposes some knowledge of Wagner’s oeuvre and a certain level of music competence, is rich in music examples. Opera depicts extreme emotional states. Taking a novel and challenging approach that combines scientific diagnostic approaches with literary and musical analysis, the retired, musically-trained psychiatrist John Cordingly examines the disordered personalities of twelve male operatic protagonists. On the one hand, he gathers together varied historical opinions on the contentious concept of personality disorder. On the other hand, he assesses operatic protagonists through music, words and performance, as well as through source material and in some cases the biographies of the works’ creators. He does not view his protagonists as ‘mad’. But are they bad, or are they Byronic heroes, he asks? Should they be punished or are they in need of treatment? And what is their sexuality? From the hubristic Otello and Boris Godunov to the psychopathic Iago and John Claggart; from the schizoid Wozzeck and Peter Grimes to the borderline Werther and Herman; from the narcissistic Don Giovanni and Eugene Onegin to the repressed and melancholic Faust and Gustav von Aschenbach, Cordingly places human nature under the psychiatric spotlight. In their diversity and complexity, he shows how these men reflect timeless aspects of us all. In 2012 Plumbago will be publishing Christopher Dromey’s The Pierrot Ensembles. Chronicle and Catalogue (1912-2012), a meticulous study of the first hundred years of the kind of mixed chamber ensemble, with or without voice, ushered in by Arnold Schoenberg’s Pierrot lunaire (1911), with an emphasis on its development in Britain. This volume has been funded by Middlesex University. In 2013 Plumbago will celebrate the centenary of the birth of Benjamin Britten with Hans Keller’s Britten. The Creative Character and Other Writings, a selection of the principal essays on the composer by his lifelong champion Hans Keller, including previously unpublished correspondence and other rarely available work. This volume is to be funded by The Cosman Keller Art and Music Trust. Plumbago Books and Arts is especially proud to announce the publication of BBC Music in the Glock Era and After by Leo Black with copious illustrations by Milein Cosman. The BBC of the 1960s, a formative time in the evolution of British broadcasting, is now swathed in hearsay. As a corrective Leo Black's vivid and personable new memoir offers an authoritative account of how the Music Programmes Department was organized, with character studies of William Glock downwards and memoirs of many its composers and performers. Nowadays these men and women are not so much forgotten as imprecisely remembered. This book offers a more focussed account of them and their achievements and ends with a moving chapter of autobiography. The volume is edited by Christopher Wintle with the assistance of Kate Hopkins and is funded by the Cosman Keller Art and Music Trust. Copies, hardback and paperback, are available from Boydell & Brewer in the normal way. On Tuesday 24 November 2009, Plumbago Books and Arts are proud to release a new 2010 Calendar with illustrations by Milein Cosman. Entitled ‘Dancers’, it gathers images from round the world, especially the Far East. The expert typography is once more by Julian Littlewood. Already hailed as an exceptionally beautiful production, it is the centrepiece of an exhibition of 49 works featuring dancers by Milein Cosman at the New End Gallery, 27 Carnegie House, New End, Hampstead, London NW3 1JE (0207.443.5557) running from 24 November to 20 December. The calendar is priced at £9.99 and is also available from the Courtauld Gallery Bookshop, Somerset House, London. The artworks in the exhibition are also for sale. Plumbago Books is pleased to announce that it will be publishing a selection of writings by the eminent British music critic Bayan Northcott early in 2009. Entitled The Way We Listen Now and Other Writings on Music, its publication costs will be met by a generous grant from the Cosman Keller Art and Music Trust. Plumbago Books and Arts is pleased to announce the formal launch of Hugh Wood’s Staking Out the Territory and Other Writings on Music at the Austrian Cultural Forum, 28 Rutland Gate SW7 1PG, on 26 February 2008. The volume, which has been published with financial support from both the Cosman-Keller Art and Music Trust and the William Scott Estate, has been chosen as the BBC Book of the Month for March 2008: a report will be appearing in the March issue of the BBC Music Magazine. Plumbago is pleased to announce the award of two grants towards the publication of our collection of writings by the British composer Hugh Wood, Staking Out the Territory (2007). The Cosman Keller Art and Music Trust has agreed to meet the cost of printing and typing, and the William Scott Estate the cost of colour reproduction of paintings. The book will be released in the autumn through Boydell & Brewer. Plumbago is pleased to announce the award of three generous grants towards two new books. The William Alwyn Foundation, through the Cambridge University Library, is meeting the full publication costs of the latest volume in the Hans Keller Archive series, Film Music and Beyond: Writings on Music and the Screen, 1946-59; and The Britten Estate Ltd., together with the Institute of Advanced Musical Studies (King's College London), is meeting the costs of the latest volume in the Poetics of Music series, Christopher Wintle's All the Gods: Benjamin Britten's Night-piece in Context edited by Julian Littlewood. Both books will be available from Boydell & Brewer in mid-November (boydell@trading.co.uk). Plumbago Books and Arts is delighted to announce the publication of Towards a Poetics of Music and the Arts by Christopher Wintle, including Works with Music, reproductions of a collections of artworks by the well-known Brazilian artist Ana Maria Pacheco. In its investigation of the relationship between art and life the book touches on a eclectic array of subjects, expressed through aphorism, short texts and fables. It may be purchased from Boydell and Brewer, directly from the publisher (plumbago@btinternet.com) or from booksellers in the usual way. On Wednesday 6 October 2004, Plumbago Books, in association with its distributor Boydell and Brewer Ltd, will be launching their latest publication, The Variations of Johannes Brahms by Julian Littlewood. The launch will take place in The Viscount St David's Room, King's College London, Strand, London WC2R 2LS at 6.00pm. Admission is free: all are welcome. (The room is situated immediately opposite the College Chapel). The launch will follow a talk in the same venue by Dr Littlewood on issues arising from the book: this starts at 5.00pm. Copies of the book will be sold at a discount price. Plumbago Books and Arts is proud to announce the arrival of their new A3 pads of Music Manuscript Paper suitable for Voice-leading (Schenkerian) Analysis and Musical Composition. Each pad contains 30 sheets, 25 of which contain 4 systems of two staves and 5 of which contain 3 systems of three staves. The pads, which have been designed by Christopher Wintle and Julian Littlewood, may be bought from Boosey and Hawkes (Britten's), 295 Regent Street, London W1R 8JH, Blackwell's Music Shop, Broad Street, Oxford, OX1 3AX and Brian Jordan Music Books (10 Green Street, Cambridge CB2 3JU). Other outlets will be announced early in the autumn. Plumbago Books and Arts is delighted to announce that as from 1 September 2004 its books will be distributed throughout the UK, Europe and the English-speaking world by Boydell and Brewer Ltd. (Woodbridge/Ipswich), and in the US by its partner, the University of Rochester Press (Rochester). Although the publications will be advertised in the Boydell and Brewer/U of Rochester catalogues (as books from Plumbago), Plumbago will retain its editorial independence. Details of ordering and dispatch will be posted on this site later in August; until then the books may be ordered directly from the publisher (plumbago@btinternet.com) or from booksellers in the usual way. We are delighted to announce that Plumbago Books and Arts has been awarded a grant to cover the full research and publication costs of the next volume in our Hans Keller Archive series, a joint project with the Cambridge University Library. The grant has been awarded by the William Alwyn Foundation (administered by APK Music Promotions Ltd.) to celebrate the centenary of William Alwyn in 2005. William Alwyn was one of the most distinguished composers of wartime and post-war British film music, as well as a composer of concert music. The book will be a collection of Keller's writings on music for the screen 1946-59, Film Music and Beyond. It will be edited by Christopher Wintle, and published by Plumbago Books and Arts in the autumn of 2005. Plumbago Books is delighted to announce the award of a generous grant from the Acting Principal of King’s College London, Professor Barry Ife, towards the publication costs of The Variations of Johannes Brahms by Julian Littlewood. The book, which is due to appear later this year, will inaugurate a new series of books devoted to the Poetics of Music edited by Christopher Wintle. It will also contribute to the 175th anniversary celebrations of the College. With the direct help of Plumbago Books and Arts, the Ashmolean Museum, Oxford has just acquired Milein Cosman’s Oxford/Slade drawings from 1940-43. These have been described by the Director, Dr. Christopher Brown, as being ‘hugely important’ historically as well as ‘beautiful and significant’ in their own right. We are delighted to announce that the prize for an outstanding book on music appearing in the UK during the year 2001 has been awarded to our recent publication: Hans Keller, The Jerusalem Diary. Music, Society, and Politics, 1977 and 1979. The Royal Philharmonic Society citation [reproduced in the BBC Music Magazine, June 2002] deemed The Jeruslaem Diary to be 'outstanding both for the profusion and originality of its musical ideas and for its powerful, idiosyncratic linguistic energy. The book teems with insights on other subjects, most prominently the politics of the young state of Israel. The jury admired, too, the way in which, for Keller, music becomes an intellectual force informing all other disciplines. Music was evidently to him what poetry was to Wordsworth, 'the breath and finer spirit of all knowledge'. Click here for further details.